Released just a few months ago, today’s Read is already delightfully dated. As of Sunday, a new chapter needs to be added to The Pats: An Illustrated History of the New England Patriots by Glenn Stout and Richard A. Johnson. 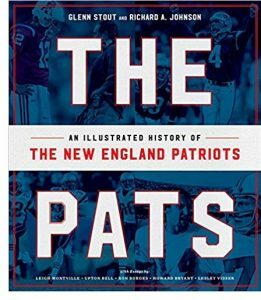 Still, this book is chock full of the whole history of the Pats, including the tough years long before three guys named Brady, Belichick and Kraft showed up – which makes a fan (and outside observers) appreciate even more what the franchise has accomplished in the past two decades. The Pats: An Illustrated History of the New England Patriots by Glenn Stout and Richard A. Johnson is available from Amazon and other fine booksellers everywhere. Lost Cowboy is powered by	WordPress 5.0.4 and delivered to you in 0.746 seconds using 45 queries.